In this article, I will cover 5 websites to make system architecture diagram online for free. System Architecture is a formal description of a system that defines its structure and behavior. A system architecture diagram displays the relationship between the components of a system including both, software and hardware. Generally, system architecture diagrams are created for hardware architecture, software architecture, enterprise architecture, and web applications. With the following 5 websites, you can easily make system architecture diagram online. These websites offer built in shape collection for various system architectures and web applications architectures which make it easier to draw system architecture diagram. So, let’s check out these websites one by one. Draw.io is a free online fully-featured diagram editor where you can make almost any type of diagram. It doesn’t have account support means you can easily open it anywhere and start making diagrams right away. After making the diagrams, you can export them to the computer or directly upload them to your cloud storage. 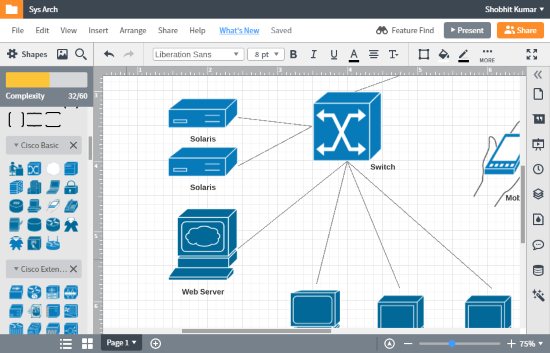 Draw.io has a large collection of diagrams shapes which includes various system architectures such as IBM, Google Cloud Platform, AWS, AWS 3D, Azure, Allied Telesis, Network, Citrix, Cisco Safe, Cloud & Enterprise, Office, and more. In case, you still don’t find the desired shape for your diagram, you can make custom shapes here using the diagramming and customization tools. On top of that, you can also import shapes and images and add them to your diagram. To make the diagrams more interesting, you can fill the shapes with color, change text format, and add shadow and border as well. With all these options and tools, you can easily make any type of system architecture diagram with this editor. Make system architecture diagram online here. Diagramiq is another free online diagramming tool where you can conceptualize your project by making diagrams easily. Compared to Draw.io, it is a simpler tool that focuses only on the conceptual diagrams and doesn’t offer many visual customization options. It has a mediocre shape library that has all the essential shapes along with Amazon AWS, UML, Containers, Icons BPMN 2.0, and more. Apart from the built-in shapes, you can also upload images and SVG files and use them in the diagrams. In order to use this diagramming tool, you have to create an account first. The account support lets you save your diagram online which you can access anytime. This tool also has a chat option from where you can add collaborator and chat with them. If you want to save a copy of your diagram, you can download it to your computer as a PNG or PDF file. 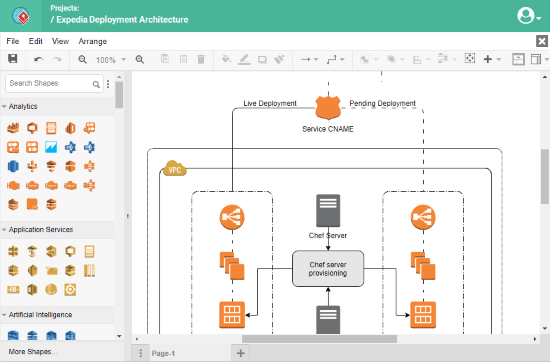 You can make system architecture diagram online with Diagramiq here. The next website to make system architecture diagram online is LucidChart. It is one of the most feature-rich online diagram editors that has its own marketplace from where you can add more functionalities to it. As you might suspect, this editor does have a premium membership which gives you access to all its features although you can use all the basic features for free. The free users are limited to keep at most 3 documents in their library. If you reach that number, you have to delete your existing document(s) in order to create new. With that said, this editor packs a great extent of shapes covering AWS Architecture, Azure, BPMN 2.0, Cisco, Google Cloud Platform, UML, and many more. On top of that, it lets you import SVG and Visio Stencil as well. 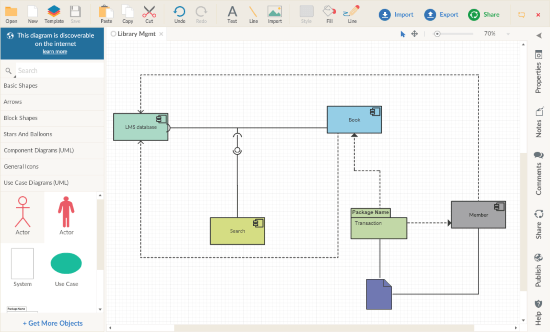 With its huge shape library and import options, LucidChart is a great online tool to make any type of system architecture diagrams. After making the diagrams here, you can save them to your account, export to your cloud storage, or download to your computer as well with various format options to choose from. 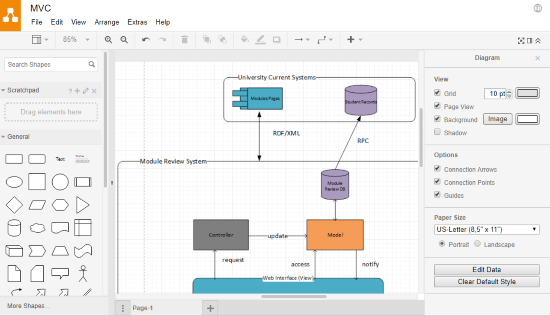 Make system architecture diagram online with LucidChart here. 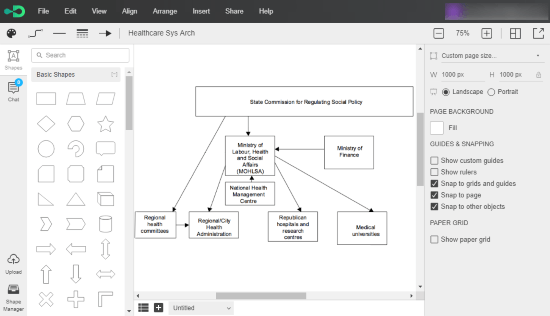 Creately is another freemium diagram editor with online collaboration. Just like LucidChart, the free Creately users can keep up to 3 documents in their library and add up to 3 collaborators. To make more than 3 diagrams, you can export the existing diagrams as JPEG or PNG files and delete them from your Creately account to make room for new ones. For the system architecture diagrams, you get a decent shape library that covers Amazon Web Services, Infographics, Networking, Software, UML, Web Design and other basic shapes. You can also import Visio, VDX, VSX, and VTX libraries and stencils here to add more shapes. With all those shapes and options, you can make almost any type of system architecture diagram here. Here is a link to try this online system architecture diagram maker website. Online Visual-Paradigm is an online version of the popular modeling and diagramming software, Visual-Paradigm. Unlike the software, this online version of Visual-Paradigm is freemium that offers all the essential features for free. Inherited from its parent, this tool has dozens of shape libraries covering AWS Architecture, Azure Architecture, Google Cloud Platform, Alibaba Cloud Architecture, Tencent Cloud Architecture, Network, InfoArt, and many more. Apart from the shapes, Online Visual-Paradigm packs all the essential diagramming tools which are simple to use. All these features allow you to make any type of system architecture diagrams here. This editor lets you download the diagrams in PNG, JPEG, SVG, GIFF, or PDF file format. You can also export the diagrams directly to your Google Drive. Try Online Visual-Paradigm to make system architecture diagram online here. These are the 5 websites to make system architecture diagram online. Depending on the number of diagrams you have to make and the options you need (like cloud integration, online collaboration, export options, etc. ), you can go with any of these websites to make your diagrams.